Color glaze can help cool brassy tones while imparting shine. When it comes to hair color, there's a fine line between honey tones and brassy locks. When your hair goes just a bit too golden or orange, there are ways to cool off the brass. A glaze is a temporary coating for your hair -- think one to two weeks -- that adds shine and can offer minor color correction. Some glazes are clear, but you'll need a cool-tone glaze that's close to your hair color shade to help neutralize brassiness. Choose a semi- or demi-permanent color glaze that matches your shade -- in other words, don't put a blonde glaze on brunette hair, or vice versa. The glaze should indicate "cool" or "ash" on the box, which helps neutralize brassiness. "Warm" glazes amp up golden or red tones, which makes brassiness even more pronounced. 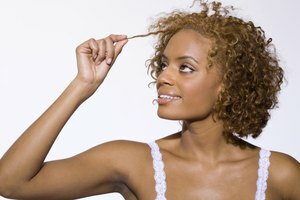 Comb or brush dry hair to remove tangles. Drape an old towel around your shoulders and wear plastic gloves to protect your skin and clothes from the glaze. Run your comb horizontally from one ear across the back of your head to your other ear to separate the top and bottom sections of your hair. Secure the top section at the top of your head with a stylist's clip. 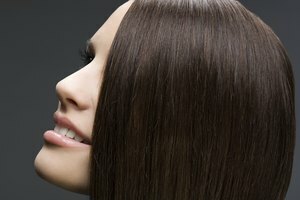 If your hair is very thick or long, you can separate the top and bottom sections into several smaller sections. Your goal is to evenly coat all of the hair. If your hair is too short to clip, you can skip this step. Mix the glaze according to the directions on the package. 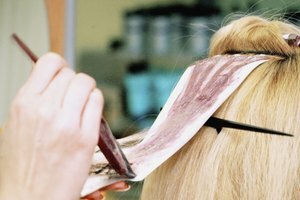 Squeeze the glaze onto the bottom section of your hair in vertical strips from just below your roots down the length of the hair. Use a hair color application brush, your gloved fingers or a comb to distribute the glaze evenly throughout the hair from roots to ends. For shorter hair, apply the glaze and gently massage or comb the hair to distribute the product evenly. You can apply glaze to short hair from the back to the front of your head or from front to back, as long as you coat all of the hair in product. Remove the clip from the top section and squeeze the product from the hairline down the length of the hair. Avoid your forehead and the skin around your hairline. Use the brush, comb or your fingers to distribute the color evenly. Clip all of your glazed hair into a stylist's clip -- if your hair is long -- and cover your hair with a plastic shower cap. The shower cap traps the heat from your scalp and helps the glaze develop. Allow it to develop for the time indicated on the directions. Wash and style your hair as usual. If the directions on your glaze don't contraindicate heat, you can use a hair dryer to blow warm air over the shower cap for 3 minutes. The extra warmth will help the glaze develop. Purple-toned shampoos and conditioners can also help remove minor brassiness. Purple is opposite to yellow on the color wheel, so purple tints neutralize overly golden tones. If you're using a new product, consider performing a skin test before using it over your entire head. Apply a small amount of the mixed glaze to your skin -- behind your ear is an inconspicuous spot -- and wait 48 hours. If you notice any redness or irritation, rinse immediately with cool water and use a different product. Robinson, Lindsey. "How to Apply a Color Glaze to Reduce Brassy Hair." Synonym, https://classroom.synonym.com/apply-color-glaze-reduce-brassy-hair-22347.html. Accessed 19 April 2019.